This species is native to the Phillipines and Taiwan where it grows in lowland forest. It has long lasting waxy flowers that appear along the stem at the leaf axils. The plant seems to prefer to grow pendulously and so we grow it both mounted and in baskets. 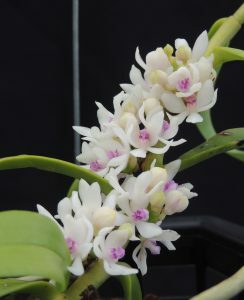 Jess also grows it very successfully as a house plant and she has it flowering this week too. This is a piece from a wonderful specimen displayed by Chantelle orchids at the European Orchid Congress in London in 2015 where it won best specimen plant. It comes from warm forest but we find it prefers life in Cool Americas (min 12C) where it is cool wet and humid.